See more objects with the tag architecture, exhibition, modernism, World's Fair, Bauhaus. This is a Book Illustration. It was published by Board of the Mies van der Rohe German Pavilion in Barcelona. It is dated 1979. Its medium is photographic reproduction, paper. It is a part of the Smithsonian Libraries department. German-born Ludwig Mies van der Rohe developed an influential architectural style based on principles of minimalism, rationality, and simplicity. During his time as director of architecture at the Bauhaus school, his style evolved to incorporate their principles of functionalism and simple geometric forms. In 1929, Mies designed the German Pavilion for the Barcelona Exposition. 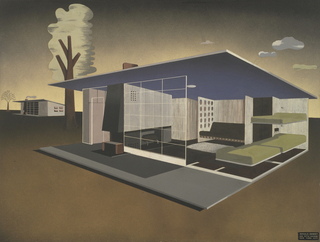 The pavilion, recognized as one of his great masterpieces, combines his own principles with Bauhaus theories. The structure consists of a series of slabs that rest on a central travertine plinth, and features an open, continuous space that dramatically links the inside to the outside of the building. The pavilion chronicles the spirit of the modern era: it promotes the essence of pre-fabricated construction, the simplicity of forms, and the Bauhaus concept that "less is more."